Knit the graphic Chevron Mesh Scarf from the popular Knit.Wear Spring 2014 with this kit. This kit includes four skeins of Kollage Yarn's Glisten yarn. Add graphic color to your wardrobe with this knitted accessory kit! 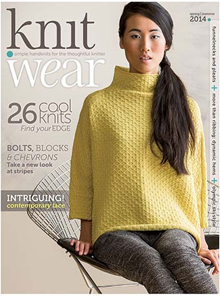 This Knitting Daily exclusive kit features the new issue of Knit.Wear Spring 2014 and enough yarn to knit the popular Chevron Mesh Knitted scarf exactly as it appears in the magazine. Hurry! We have a limited number of kits, so order yours today while supplies last. This special issue features 26 patterns that celebrate style and simplicity. Take a new approach to lace with contemporary and intriguing lace stitches, or knit playful shapes with graphic colorwork techniques. Develop new shaping skills with a look at funnelnecks and pleats, and try a new approach to hemlines with ribbing ideas. This uses a modular construction—stitches are easily picked up to knit each section. Using two high-contrast colors, the sections of this graphic scarf form an asymmetrical chevron pattern worked in alternating bands. The scarf measures 6.5 inches wide by 80 inches long. Kollage Yarn's Glisten yarn is an alpaca blend with a touch of glisten. Solid dyed in rich colors, this yarn is accented by a delicate wisp of metallic. Each skein of yarn contains 50 grams and 91 yards of yarn. 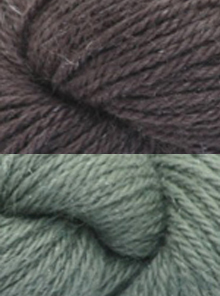 Glisten yarn is composed of 75% alpaca, 20% silk, and 5% estillina. This kit includes enough yarn to knit the Chevron Mesh Scarf featured in Knit.Wear Spring 2014 exactly as it appears. *Colors may vary slightly from what is seen here. Chevron Mesh Knitted Scarf Kits.